Chelsea FC are back on the talent search and are looking for more grassroots football stars from within the Asian community. Now in it's second season, the club's Search for an Asian Soccer Star is offering six players the chance to win a week-long trial at the Premier League club's academy. Two of the Asian stars identified in last year's inaugural search have since gone on to sign for Leyton Orient and Southend United respectively, living the dream of moving from Sunday League football to the professional game. Run in partnership with Kick it Out and the Asian Media Group, this season's search which will take place over the Bank Holiday weekend on 29-31 May and is open to players from Indian, Pakistani, Sri Lankan and Bangladeshi backgrounds aged 8-13. Participants will be judged on a series of matches and tests specifically designed and used by the Chelsea Academy to examine speed, skill and ability. One player from each age group will be selected for a week’s training with the Chelsea Academy squads during the summer, with any player meeting the required standard being offered the chance to be signed by the Blues. The initiative is the first of its kind ever undertaken by a professional football club and is designed to give a much needed boost to Asian participation at all levels of the game. Last year’s initiative saw 350 young people attending the Cobham training ground. Three winning players then trained and represented Chelsea teams during the summer, with two of them going on to be signed by Leyton Orient and Southend. Simon Taylor, Chelsea’s Head of Corporate & Social Responsibility said: "Last year was a massive success with two of the boys going from Sunday League football to play for professional clubs. We want this year’s tournament to be bigger and better so we have doubled the amount of age groups and trials on offer. "The scheme is not just about finding the next Anelka, Drogba or Lampard. It is about breaking down barriers, showing Asian players that opportunities at all levels of the game do exist and encouraging them to maximise their potential." Chelsea will also be inviting managers, coaches and scouts from clubs at all levels of the game to identify talented youngsters and information will also be on hand for Asian players to find clubs in their area. Piara Powar, Director of Kick It Out added: "We fully endorse the Search for an Asian Star initiative. The outcomes from the 2009 initiative demonstrate how a project like this can break down stereotypes and give genuine opportunities in the professional game for talented young Asian players. "The Chelsea scheme uses the best that the club can offer to reach out to the best talent in a way that gives other young Asians the encouragement to believe that there is a place in the game for them." 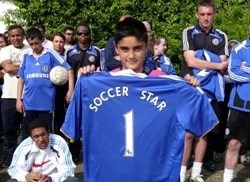 To find out more visit www.chelseafc.com/asiansoccerstar.